Having company is the best… feeding them, while working all day, going out at night and juggling home life, sometimes calls for a bit more creativity, especially if you can’t just hop in your car and run to the supermarket. Shopping, for me, usually involves walking to the train, going into the city (about 20+ mins) and lugging a couple bags home hoping that I remembered everything I need to make an edible meal. Yes, there’s a closer supermarket to my house, but they haven’t yet discovered natural products, organic produce, or the fact that green veggies should be green and not brown or yellow!! Last weekend one of my super talented hardworking friends was in town prepping a prop job for a photo shoot (and dressing to the 9′s.. check out her fashion blog: fashionbater), so I threw together this little farm-fresh (in the city) porridge bowl to recharge our weary bodies before heading out to the new Alexander McQueen exhibit at the MET. So what’s for brunch?? The base of the dish is polenta grits cooked according to package directions (more about them here). The dish is topped off with a few seasonal veggies and cheese: sliced roasted beets, fresh Mozzarella cheese, spinach sauteed lightly with just a dash of fresh garlic, jalapeno pickled carrot and jalapeno, and one egg cooked blindfold-style. Assemble in a bowl and wallah- instant energy to get you through a busy afternoon of cultural schlepping about the in the city, and maybe a little shopping!! The nice thing about this dish is you can jazz up the polenta porridge with just about any fresh veggie combo you might have in the fridge. Zucchini, squash, fresh sliced tomatoes, goat cheese, roasted eggplant, ricotta, sauteed kale, mushrooms – any combination of these could be great with an egg!! Dig around in your fridge and see what you can come up with. Side note on cooking the eggs: Eggs blindfold is a favorite of mine because it’s pretty much a hybrid between a fry and a poach. Crack the eggs in the pan and cook over medium heat until the whites begin to set around the edges. Toss in about 3 ice cubes, cover, and cook for about 2 minutes. Eggs are done when they white over the yolks as seen in the picture above. 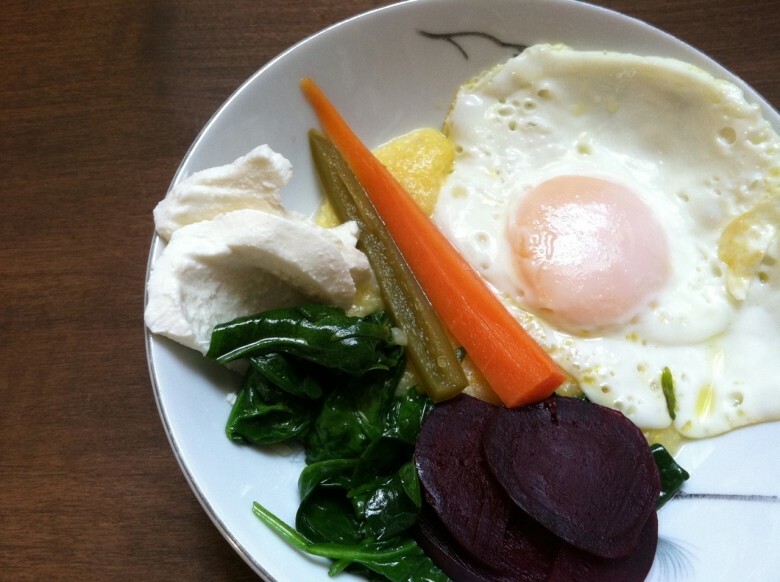 May 15, 2011 | Filed under breakfast, brunch, gluten free, vegetarian and tagged with beets, eggs, pickles, polenta, spinach.